NVIDIA released a new Game Ready Driver for the Apex Legends. We also announced a new bundle for GeForce RTX GPUs that includes Metro Exodus, AnthemTM, and/or BattlefieldTM V. GeForce Gamers can play their new titles on a trifecta of new G-SYNC Compatible displays. NVIDIA has an exciting new ‘Triple Threat’ bundle for GeForce RTX that starts today. 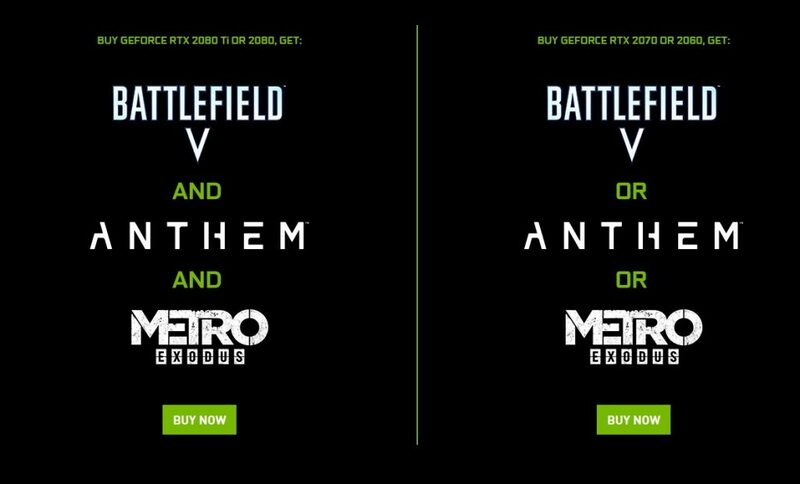 Gamers get Metro Exodus, Anthem, and Battlefield V with the purchase an eligible GeForce RTX 2080 Ti or 2080 GPU, desktop and laptop. Or, if gamers buy a GeForce RTX 2070 or 2060 GPU, desktop or laptop, they can pick one of the three. Under the G-SYNC Compatible program, NVIDIA works with monitor OEMs to validate the experience on monitors that support the AdaptiveSync protocol. Those that pass are designated as “G-SYNC Compatible”. For a full listing of G-SYNC Compatible displays, please click here. Our latest GeForce Game Ready driver will optimize your experience in Apex Legends. It also will provide the best experience for Devil May Cry 5 and Tom Clancy’s Division II. Game Ready Drivers are available on or before launch day for most major titles and are tuned for best performance and flawless gameplay. Every Game Ready Driver is also Microsoft WHQL-certified.